MetaTrader 4 is a powerful trading platform, loaded with many useful features. The various tools can be launched via the on-screen menus, but you may find it quicker and easier to launch them using keyboard shortcuts. 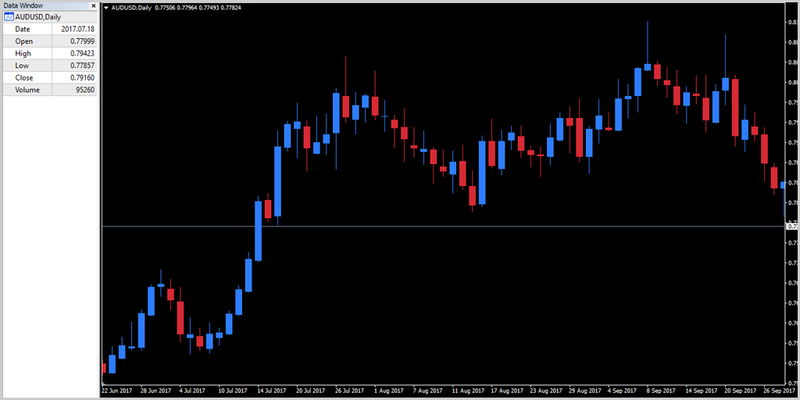 This article will reveal some of the more useful MetaTrader 4 (MT4) and MetaTrader 5 (MT5) hotkeys. We'll also take a look at how you can set up your own bespoke shortcuts. Source: MetaTrader 4 - AUD/USD Hourly Chart - Data Range: 3 October, 2017 - 10 October, 2017 - Please Note: Past performance does not indicate future results, nor is it a reliable indicator of future performance. You can move back and forth in a chart by clicking and dragging with your mouse, and then clicking on icons on the toolbar to change the magnification. You may find it, however, more convenient to use keyboard shortcuts. You can zoom out with the minus key (-) and zoom in with the "+" key (that is, SHIFT + = on the main part of your keyboard, or you can just type "+" directly if you also have a number pad). You can also use the cursor keys to scroll back and forward through time on the chart. The right cursor key scrolls forward through a chart, while the left cursor key scrolls back in time on a chart. If you want to scroll through a chart even faster than this, you can use the 'Page Up' and 'Page Down' buttons. 'Page Up' fast scrolls back in time (that is, it scrolls to the left on the chart), while 'Page Down' will fast scroll forward in time (that is, it scrolls to the right on the chart). 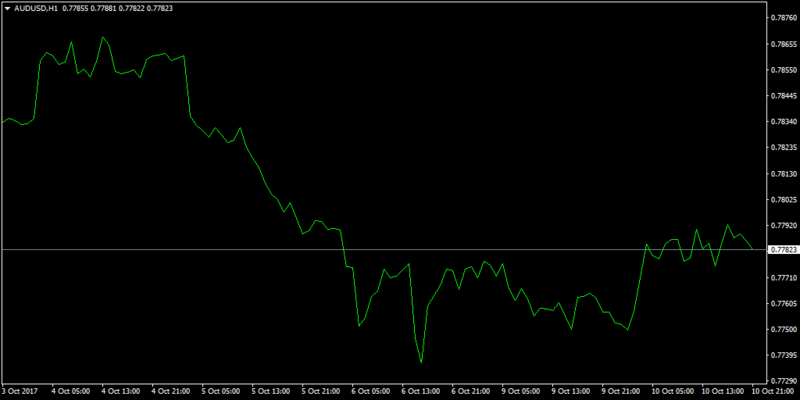 The 'Home' key will jump to the earliest data point available on your chart. The 'End' key will jump to the current (most recent) bar. Pressing the 'Enter' key opens the 'Fast Navigation' box. This is a small box that appears on the bottom left hand-side of the price chart and has multiple uses. You can use it to switch between open charts by typing in the relevant symbol. 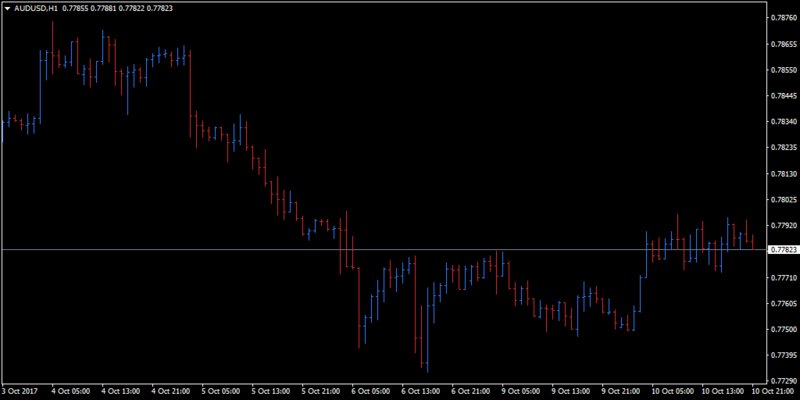 You can change the period of your open chart by typing in the desired time frame, for example: M1, H4, or D1. You can use the following MT4 hotkeys to open and close useful command windows: 'CTRL+M' opens/closes the 'Market Watch' window. This is a window that appears below the 'Navigator' and gives you a choice of two views, which can be selected by tabs. One tab is a tick chart of your instrument of choice. The other tab, called 'Symbols', is a list of instruments and prices. By clicking on an instrument in the 'Symbols' list, you can choose what to display in the tick chart. 'CTRL+N' opens MT4's 'Navigator' window. 'CTRL+T' is a shortcut for the 'Terminal' window. 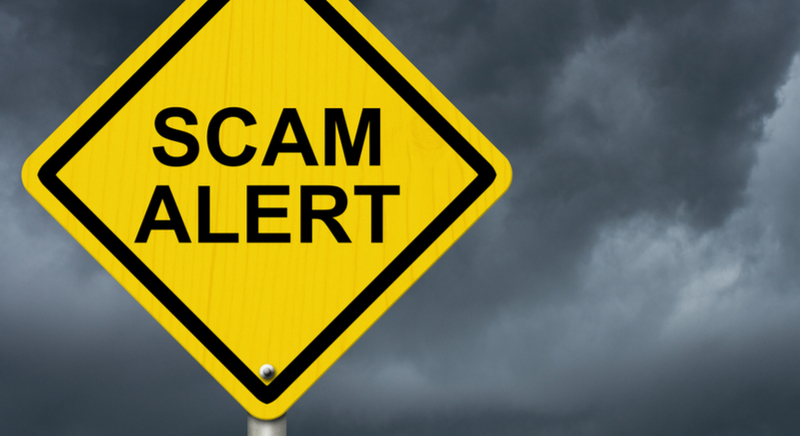 The 'Terminal' window appears at the bottom of the screen, and has several functions, including setting up alerts, viewing account history, and accessing internal mail. 'CTRL+D' will open or close the 'Data Window'. The 'Data Window' is useful for viewing precise values for each bar with ease. The image below displays a price chart with the 'Data Window' opened alongside it. Source: MetaTrader 4 - AUD/USD Daily Chart - Data Range: 22 June, 2017 - 26 September, 2017 - Please Note: Past performance does not indicate future results, nor is it a reliable indicator of future performance. - Please Note: Past performance does not indicate future results, nor is it a reliable indicator of future performance. You can call up the crosshairs object with the 'CTRL+F' shortcut. Clicking in one spot and then in a second spot with the crosshairs will show you a count of the number of bars between the two points. 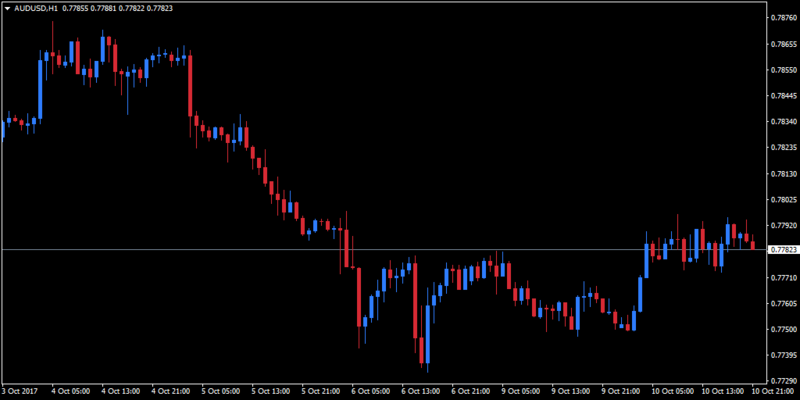 This also displays the value in pips between the two points (i.e. the vertical distance). Some MT4 keyboard shortcuts are standard ones that you may already know from similar uses in other applications. For example, if you want to print a chart, the shortcut is 'CTRL+P'. 'Backspace' will delete the most recently added object from your chart. If you accidentally delete an object from a chart, you can use 'CTRL+Z' to undo the deletion (ALT+Backspace will perform the same undo function). 'CTRL+S' will save the current chart. You can use the function keys on your keyboard to access a variety of functions in MT4 and MT5, all with a single keystroke. 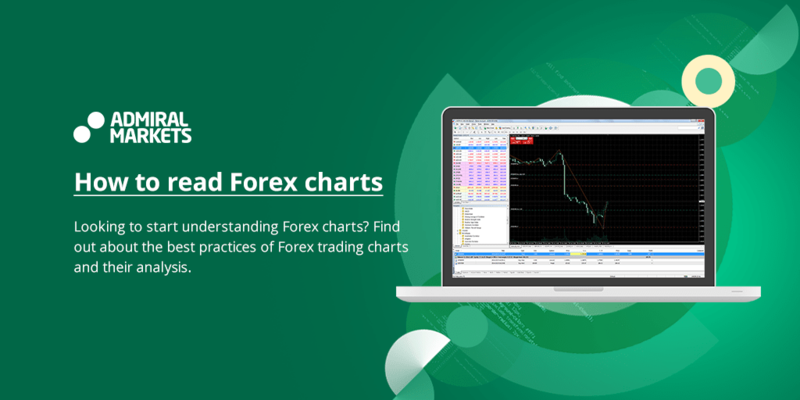 'F1' opens the MetaTrader user guide. 'F8' opens the properties window, which allows you to change the look and feel of your chart, along with a number of other settings. 'F9' opens the new order window. 'F10' opens the 'Popup-prices' window – this is a table of instrument symbols along with the 'Bid' and 'Ask' prices. Double clicking on an instrument will launch a new order window for it. 'F11' puts the platform into full screen mode. This takes you from the normal setup of the 'Navigator' on the left of your price chart and the terminal below, to showing just the current price chart, taking up the whole screen in the process. Pressing 'F11' again will take you out of full screen mode. 'F12' allows you to go step-by-step through each bar of the chart. Pressing 'F12' will page forward through each bar of the chart, so that you can conduct precise investigations into market price action. Want to go back as well? Simple – just use 'Shift+F12'. As you can see from the screenshot, you can choose between 'ALT' and 'CTRL' and then specify the key combination you want to use. 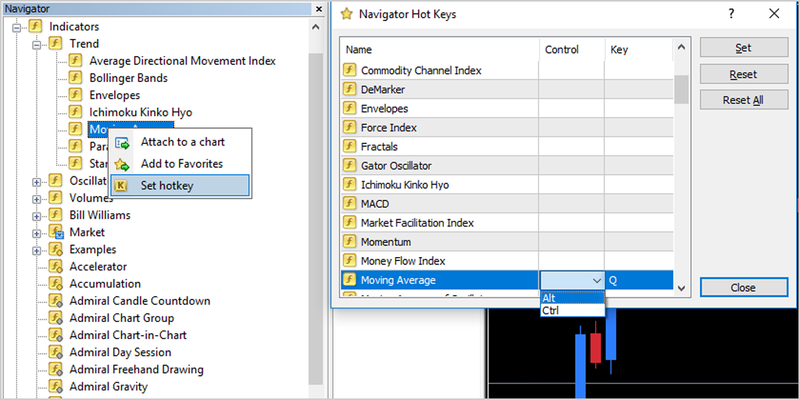 In this example, the trader decided to set 'ALT+Q' as their hotkey for the Moving Average Indicator, making it much quicker and easier for them to launch the tool for frequential use. So you can see that there are many useful tools in MT4 that can be launched very quickly with just a combination of keystrokes. But what if you want to expand the functionality of your platform even further? 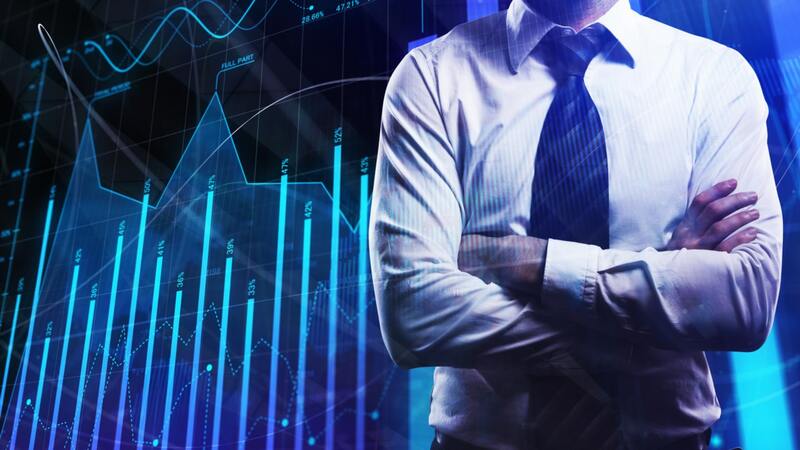 One of the key strengths that lies behind MT4's popularity is that it allows users to program their own indicators and Expert Advisors with the MQL4 language. 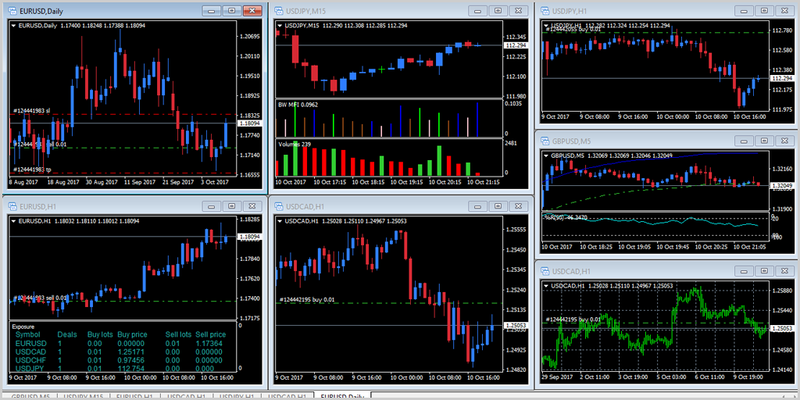 There are a vast number of custom indicators available for download from the MT4 community. The quality varies, however, and you may prefer to expand your tools in a single download from a trusted source. If so, you should consider downloading MetaTrader Supreme Edition. 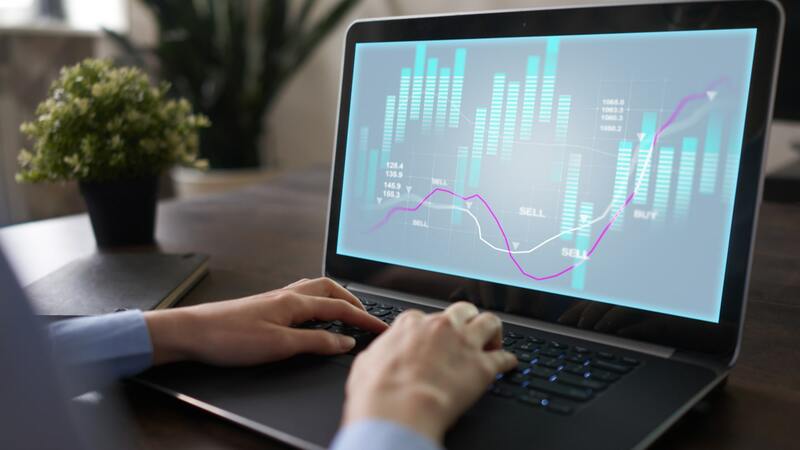 MTSE is a custom plugin for MetaTrader 4 and MetaTrader 5, offering a comprehensive selection of cutting-edge trading tools that have been developed by market professionals. MT4 and MT5 keyboard shortcuts won't make you a better trader, but they can surely make your life a lot easier. Once you become familiar with them, you will find that they can save you a lot of time, making it quicker and more convenient to perform your chart studies. This means you can get more done in less time. Try some of them out next time you are planning your trading strategies, and see how much time you could save yourself. 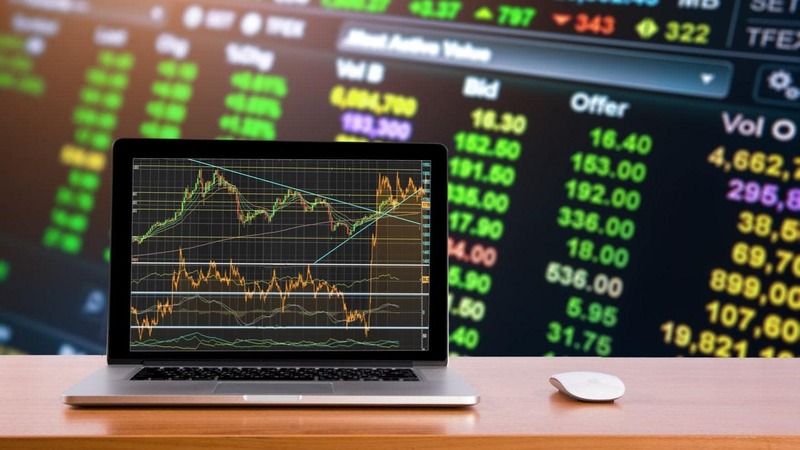 If you are aiming to practise trading, the best way to explore new methods and try out your trading strategies is with a demo trading account. 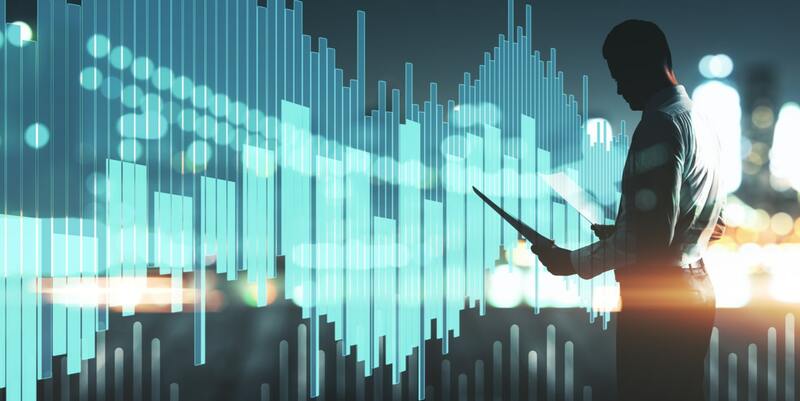 Demo trading gives you access to real live prices and the functionality of MT4, but also enables you to trade without risking any real money. It's a useful way to polish your skills until you are ready and confident to place a real trade. We hope that you have found this to be a useful guide for MetaTrader 4 and MetaTrader 5 shortcuts.